100% complete: Main and side missions, optional challenges, land, sea and underwater exploration all streamlined for 100% completion. All secrets: All unlockables, all bonuses, all collectible items, all hidden destinations and underwater ship wrecks, all lost treasure, all Achievements and all Trophies you wont miss a thing. Revolutionary Walkthrough: An at-a-glance walkthrough covers every step of Edward Kenways adventure supported by detailed, annotated screenshots and maps. Authoritative: Statistics, diagrams and expert analysis provide a comprehensive understanding of all game systems and features such as naval combat and navigation, Jackdaw ship upgrades and hunting. Story Analysis: Includes a series retrospective and breakdown of all major plot events and mysteries. This guide is quite simply exceptional. 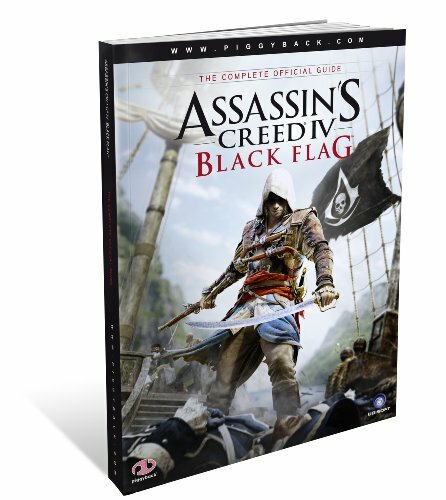 To have synthesized Assassins Creed IV Black Flag into this single volume is one remarkable achievement. It is the result of a resolute collaboration between Piggyback and the Ubisoft development teams, an association initiated by the release of Assassins Creed II. Everything you need is in here: the settings, the intrigue, the missions and an in-depth explanation of all game systems, beautifully laid out with tons of concept art. Having read this, I believe you will know as much about the game as we do, if not more.